Thousands of holidaymakers, hauliers and local residents have been caught in traffic jams in East Kent. The drivers found themselves in congestion caused by the introduction of Operation Stack on coast bound sections of the M20 in Kent because of delays to cross-channel ferry and Eurotunnel services resulting from migrant activity in Calais. “Kent is a major gateway to and from Europe but once again that gate is well and truly shut. 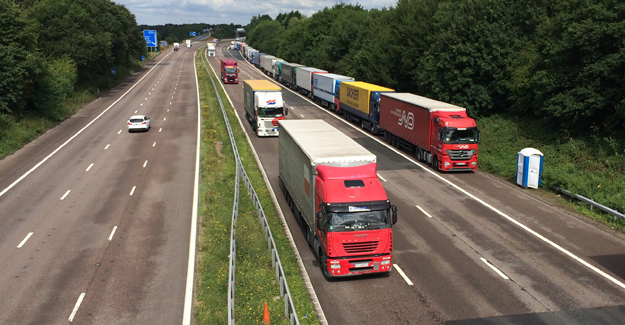 Operation Stack has become the rule rather than the exception and on one of the busiest travel weekends of the year it is causing mayhem for hauliers, holidaymakers and local residents alike. “A few months ago the government created a new road user watchdog called Transport Focus and it is good to hear it has made Operation Stack its number one priority. “Solving the immigration crisis is clearly a job for heads of government but that doesn’t mean officials here can’t do more to keep South East England moving. The depressing thing is that cross-channel disruption is nothing new and Operation Stack has been with us for almost 30 years. Yet only now are we seriously considering how to address its shortcomings. “There are clearly safety issues connected with setting up a contraflow on the M20 or allowing cars and stationary lorries to mix on the motorway, yet there are also health, safety and economic issues associated with local residents not being able to get to work, to the shops or to a doctor’s appointment.